If you or a loved one has been diagnosed with a condition that may require surgery, you owe it to yourself to learn about all of your medical options, including the most effective, least invasive surgical treatments available. 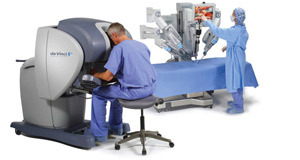 The da Vinci® Surgical System provides surgeons with an alternative to both traditional open surgery and conventional laparoscopy, putting a surgeon’s hands at the controls of a state-of-the-art robotic platform. The da Vinci System enables surgeons to perform even the most complex and delicate procedures through very small incisions with unmatched precision.